Real Madrid goalkeeper Thibaut Courtois joined the club from Chelsea in this summer’s transfer window in a deal that looked to make perfect sense at the time. The Belgium international had run his contract down to its final year at Stamford Bridge and made a couple of strong hints publicly that he wanted to be closer to his family, who are based in Spain. 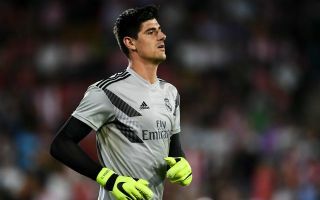 Courtois did eventually get his move as Chelsea sensibly decided not to keep an unhappy player and risk losing him on a free transfer in a year’s time, while Real Madrid not the Galactico goalkeeper signing they wanted. However, things have not gone that swimmingly for the 26-year-old at the Bernabeu so far, as he initially found himself out of starting XI under manager Julen Lopetegui. The Spanish tactician was obviously asked about this and hinted he didn’t necessarily see Courtois as his automatic first choice, which is fair enough really considering how solid Keylor Navas has been for Real. ‘It’s not a situation that’s easy to understand, but it’s simple enough to explain,’ Lopetegui was quoted in the Metro. ‘I’ve got some really good options in goal and there are no problems in that area. We’ll decide what’s best for each game. Don Balon later reported that Sergio Ramos was one Madrid player who wanted Navas to continue ahead of Courtois, with the club captain clearly staying loyal to his long-time team-mate. Courtois didn’t exactly have his best moment in goal against Athletic Bilbao at the weekend – so what next? The latest from Don Balon is that Navas has made it clear he’s ready to leave Los Blancos if he continues to be overlooked in favour of Courtois. It’s a demand Florentino Perez is said to be unlikely to give in to, which means chaos continues to unfold at Madrid. Most top clubs would be happy to have a dependable shot-stopper like Navas, who’s won the lot in his time in the Spanish capital and received little credit for that success due to not being the biggest name. Almost every summer he’s had to deal with rumours regarding Courtois and others like David de Gea replacing him, and it finally happened this time. And yet he’s always put that aside and carried on performing to a high standard, with Courtois now rocking the boat by hardly looking a worthwhile replacement anyway. Who should be Real Madrid no.1?